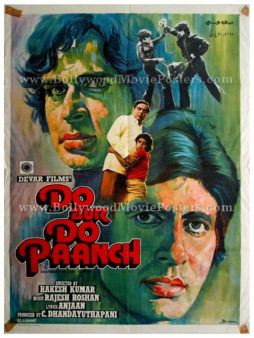 Vintage Bollywood poster of the old Amitabh movie, Do Aur Do Paanch (1980) for sale. This is an actual surviving old Bollywood poster for sale of the 1980 Hindi film that featured the greatest superstar of Indian cinema, Amitabh Bachchan and Shashi Kapoor in lead roles. Hema Malini, Parveen Babi, Kader Khan, Shreeram Lagoo and Om Prakash also starred in the film. Do Aur Do Paanch is one of the rarest among old Amitabh movie posters that money can buy, making this vintage Bollywood poster highly collectible! This Amitabh Bachchan poster features a stunning combination of both hand painted as well as photographic artwork. This vintage Bollywood poster was originally hand painted on canvas by one of the greatest and highest paid Bollywood poster painters of all time, Diwakar Karkare of Studio Diwakar fame. The printed signature of master Bollywood poster artist Diwakar is seen on the bottom right of this vintage Indian film poster. Diwakar’s mastery over the paint brush is clearly visible in this old Bollywood poster. 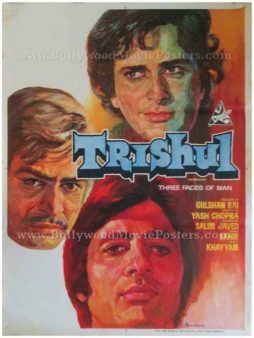 Stunning hand painted close ups of actors Amitabh Bachchan and Shashi Kapoor are seen prominently on the poster. This vintage Bollywood poster has been professionally restored by an expert paper archivist. It has been backed on cotton using a thorough acid-free conservation and restoration process. Do Aur Do Paanch is fondly remembered for its timeless title track, “Tune Abhi Dekha Nahin” sung by Kishore Kumar. 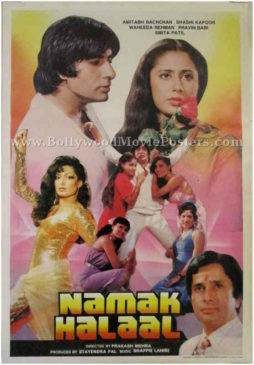 Old Bollywood poster for sale of the blockbuster Hindi film, Namak Halaal (1982). This is an actual surviving vintage Bollywood poster for sale of the 1982 super hit that featured the greatest superstar of Indian cinema, Amitabh Bachchan in the lead role. Shashi Kapoor, Smita Patil, Parveen Babi, Waheeda Rehman, Om Prakash and Ranjeet also starred in the film. 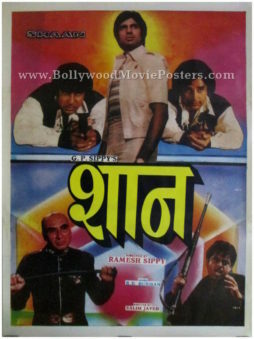 Printed and circulated subsequent to the first release of the film (somewhere in the late 1980s), this old Amitabh movie poster was originally designed for publicity of the film but never ended up being used. Namak Halaal was a blockbuster at the box office and went on to be a golden jubilee hit, making this old Amitabh movie poster highly collectible! This old Amitabh movie poster features stunning photographic artwork. Owing to the phenomenal success of the soundtrack of the film, the poster features stills from two cult songs, “Thodi Si Jo Pee Li Hai” and “Jawani Janeman Haseen Dilruba.” Superstar Amitabh Bachchan and Smita Patil are seen prominently on the top half of the poster in a romantic pose. Smaller faces of Shashi Kapoor and Parveen Babi are seen at the bottom of this Amitabh Bachchan poster. Owing to its phenomenal success, Namak Halaal was remade in both Tamil and Telugu. Music composed by Bappi Lahiri for the film was a stellar success. Songs such as “Aaj Rapat Jaayen” sung by Kishore Kumar & Asha Bhosle, “Jawani Janeman Haseen Dilruba” sung by Asha Bhosle, “Pag Ghungroo Baandh Meera Nachi Thi” sung by Kishore Kumar, “Raat Baaki Baat Baaki” sung by Bappi Lahiri and Asha Bhosle and “Thodi Si Jo Pee Li Hai” sung by Kishore Kumar are fondly remembered and played till today. 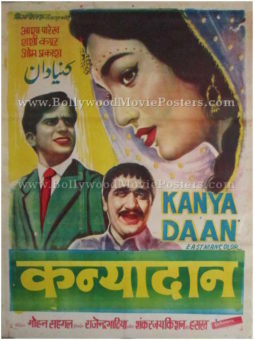 Old Bollywood poster for sale of the hit romantic Hindi film, Kanyadaan (1968). This is an actual surviving vintage Bollywood poster of the 1968 Hindi film that featured Shashi Kapoor and Asha Parekh in lead roles. 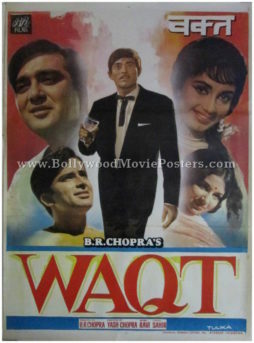 Printed and circulated shortly after the first release run of the film (late 1960s), this old Bollywood poster was originally designed for publicity of the film but never ended up being used. This old Bollywood poster was originally hand painted on canvas by a small time poster design studio in Delhi. A large quirky side profile of Asha Parekh is seen predominantly in the poster. Smaller portraits of Shashi Kapoor and Om Prakash appear at the bottom. The choice of green and yellow shades in the design gives this old Bollywood poster a very eye catching appearance. Kanyadaan’s music composed by the legendary duo Shankar Jaikishan with lyrics by Hasrat Jaipuri became a rage throughout the nation. Tracks from the film (most notably “Likhe Jo Khat Tujhe” sung by Mohammed Rafi) are fondly remembered and played till today. 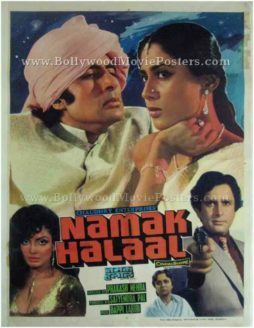 Vintage Bollywood poster of the blockbuster Hindi film, Namak Halaal (1982) for sale. This is an actual surviving old Bollywood poster for sale of the 1982 super hit that featured the greatest superstar of Indian cinema, Amitabh Bachchan in the lead role. Shashi Kapoor, Smita Patil, Parveen Babi, Waheeda Rehman, Om Prakash and Ranjeet also starred in the film. This Amitabh Bachchan poster features stunning photographic artwork. 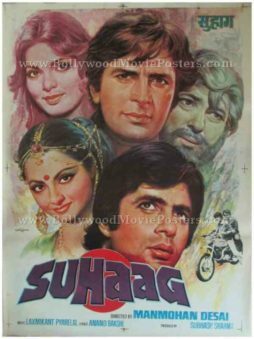 A close up portrait of superstar Amitabh Bachchan and Smita Patil taken from the cult hit song, “Pag Ghungroo Baandh Meera Nachi Thi” is seen prominently in the top half of the poster. Smaller faces of Shashi Kapoor, Parveen Babi and Waheeda Rehman are seen at the bottom. 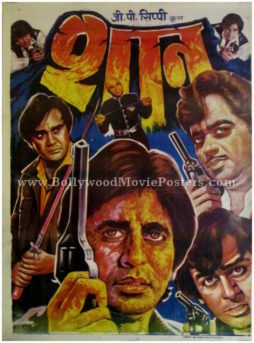 The background of this old Amitabh movie poster displays hand painted artwork. A printed signature of Bollywood poster painter Laxman is seen on the center right hand corner. 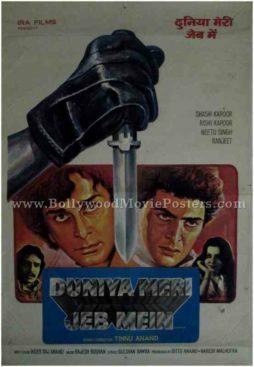 Old Hindi film poster for sale of the Bollywood action drama Duniya Meri Jeb Mein (1979). 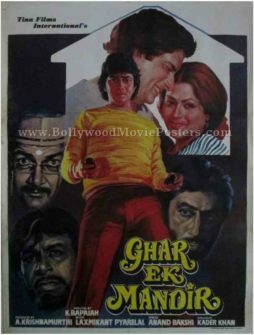 This is an actual surviving old Hindi film poster of the 1979 action drama that starred Shashi Kapoor, Rishi Kapoor and Neetu Singh in lead roles. Printed and circulated during the original first release of the film (somewhere in the late 1970s), this old Hindi film poster was printed for publicity of the film but never ended up being used. This old Hindi film poster for sale was originally designed in oil on canvas format by a leading art studio. Set against a simplistic plain white background, the poster has a minimalist appearance. 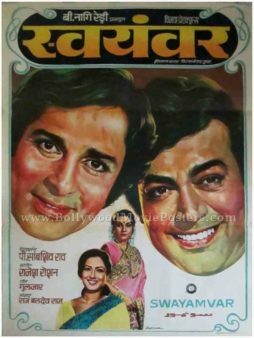 The two lead actors Shashi Kapoor and Rishi Kapoor are seen in superbly hand painted portraits prominently in this old Hindi film poster for sale. A gloved hand holding a dagger is seen dividing the two. Smaller portraits of Neetu Singh and Ranjeet are seen painted on the sides of the poster. The title of the film appears in fascinating typography at the bottom. Vintage old black and white still photograph of one of the greatest Bollywood movies ever made, Deewaar (1975) for sale. This is an actual surviving old Bollywood movie still photograph of the 1975 action Hindi film that featured the biggest superstar of Indian cinema, Amitabh Bachchan in the lead role. 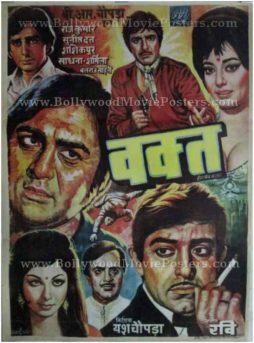 Deewaar (sometimes also spelled as Deewar) is considered one of the most iconic movies ever made in Indian cinema and finds mention among the cult films of Bollywood. Printed during the first release of Deewaar (somewhere in the mid 1970s), this black and white old Bollywood still photograph was intended to be mounted and used as lobby card display during the screening of the film but never ended up being used. 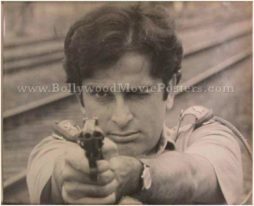 This black and white old Bollywood still photograph captures actor Shashi Kapoor taking aim with his police pistol. The still is taken from an iconic scene in the film Deewaar. 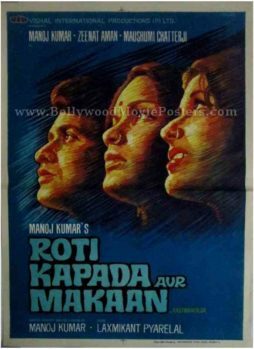 Old school Bollywood poster of the blockbuster Hindi film, Roti Kapda Aur Makaan (1974) for sale. This is an actual surviving original old Bollywood poster for sale of the 1974 Hindi film that was written, produced, directed by and starring Manoj Kumar. The film also starred the biggest superstar of Indian cinema, Amitabh Bachchan in a supporting role. The title of the movie was based on the bare necessities of life, i.e. Food, Clothing & Shelter. The film was the highest grossing Bollywood movie of 1974 and one of the biggest blockbusters of Manoj Kumar. Roti Kapda Aur Makaan also boosted superstar Amitabh Bachchan’s film career, who at the time was looking to make a mark in Bollywood, making this original old Bollywood poster for sale, highly collectible! 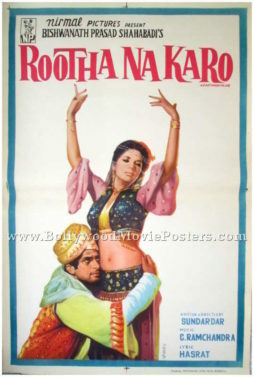 Printed and circulated during the original first release run of the film (somewhere in the early 1970s), this old Bollywood poster for sale was designed and printed for publicity of the film but never ended up being used. This old Bollywood poster was originally designed in hand painted oil on canvas format by one of the greatest Bollywood poster designers of all time, artist V.G. Parchure. The poster bears his signature in the name of his art studio Pamart on the top right hand corner. True to old school Bollywood poster painter V.G. Parchure’s mastery over the paint brush, brilliantly hand painted portraits of actors Manoj Kumar, Zeenat Aman and Moushumi Chatterjee are seen set against a blue background in this old Bollywood poster. 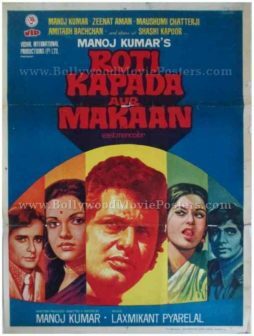 Roti Kapda Aur Makaan is a 1974 Bollywood movie written, produced, directed by and starring Manoj Kumar. The film also featured an impressive star cast comprising Shashi Kapoor, Amitabh Bachchan, Zeenat Aman and Moushumi Chatterjee. Old Bollywood poster for sale of the classic Hindi film Swayamvar (1980). 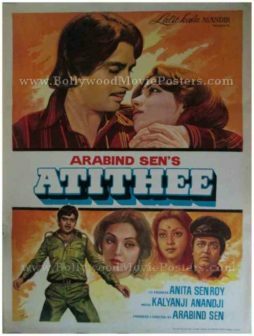 This is an actual surviving vintage Bollywood poster for sale of the 1980 Hindi film that starred Shashi Kapoor, Sanjeev Kumar and Moushumi Chatterjee in lead roles. 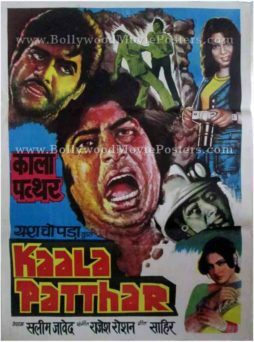 Printed and circulated during the original first release run of the film (somewhere in the late 1970s), this old Bollywood poster for sale was designed for publicity of the film but never ended up being used. This vintage Bollywood poster for sale was originally hand painted on canvas by a leading poster design studio. Stunning large hand painted faces of Shashi Kapoor and Sanjeev Kumar are seen prominently on the center of the poster. A smaller photographic still of actress Moushumi Chatterjee is seen at the bottom. The border has an interesting motif design, giving this old Bollywood poster for sale a royal look. 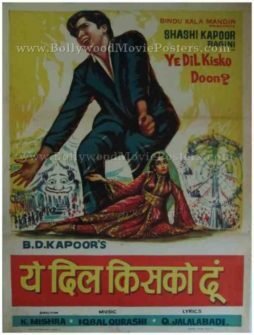 Old Bollywood poster for sale of the classic Hindi film Yeh Dil Kisko Doon (1963). This is an actual surviving old Hindi movie poster for sale of the 1963 Bollywood film that starred Shashi Kapoor and Ragini in lead roles. Printed and circulated a few years after the first release of the film (somewhere in the late 1960s), this vintage Bollywood poster for sale was designed for publicity of the film but never ended up being used. This old movie poster was originally hand designed in oil on canvas format by a small time poster art studio in Delhi. A large quirky hand drawn portrait of actor Shashi Kapoor is seen prominently in this old Bollywood poster. The background below has a carnival theme and features another quirky hand drawn portrait of actress Ragini wearing an Indian dress. The combination of bright red and yellow colors used in this old Hindi movie poster give it a very catchy appearance. Old Bollywood movie poster of the Hindi film Raja Saab (1969) for sale. This is an actual surviving old Bollywood poster for sale of the 1969 Hindi film that starred Shashi Kapoor and Nanda in lead roles. 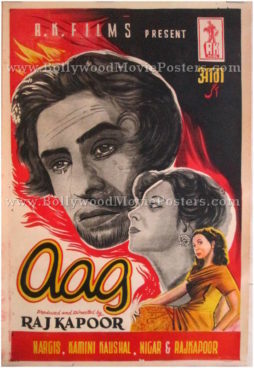 Printed and circulated during the original first release of the film (late 1960s), this old Bollywood poster for sale was designed for publicity of the film but never ended up being used. This old Bollywood poster was originally hand painted on canvas by the most expensive and sought after Bollywood poster painter of his time, Diwakar Karkare – the owner of Studio Diwakar. Diwakar’s printed signature is seen on the bottom left hand corner of this old Bollywood poster. In this old movie poster, master Bollywood poster painter Diwakar has chosen a very minimal and simplistic approach. For an Indian film that was released in the 1960s, the poster features a daring design. 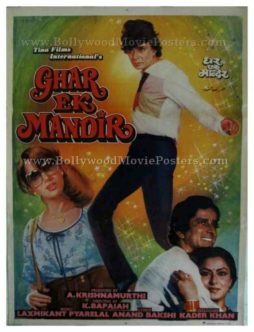 Lead couple Shashi Kapoor and Nanda are seen in a somewhat compromising pose in this old Bollywood poster for sale. Old hand painted Bollywood movie poster of the blockbuster Hindi film, Roti Kapda Aur Makaan (1974) for sale. 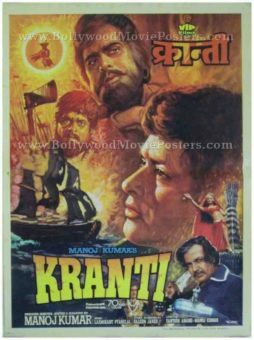 This is an actual surviving old Bollywood movie poster of the 1974 Hindi film that was written, produced, directed by and starring Manoj Kumar. The film also starred the biggest superstar of Indian cinema, Amitabh Bachchan in a supporting role. Roti Kapda Aur Makaan also boosted superstar Amitabh Bachchan’s film career, who at the time was looking to make a mark in Bollywood, making this original hand painted Bollywood poster highly collectible! Printed and circulated during the original first release run of the film (somewhere in the early 1970s), this old hand painted Bollywood poster was designed and printed for publicity of the film but never ended up being used. This poster was originally designed on a hand painted canvas by one of the greatest Bollywood poster designers of all time, artist V.G. Parchure. The poster bears his signature in the name of his art studio Pamart on the top right hand corner. True to his superb mastery over the paint brush, brilliantly hand painted portraits of actors Manoj Kumar, Amitabh Bachchan, Shashi Kapoor, Zeenat Aman and Moushumi Chatterjee are seen set inside a rainbow colored background. 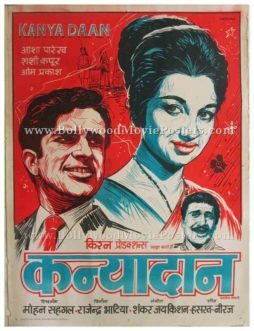 Old Bollywood movie poster of the hit romantic Hindi film, Kanyadaan (1968) for sale. 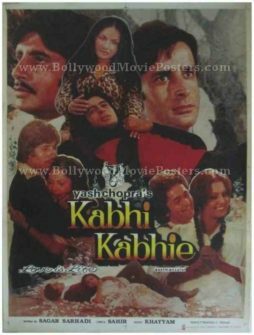 This is an actual surviving original vintage Bollywood movie poster of the 1968 Hindi film that featured Shashi Kapoor and Asha Parekh in lead roles. Printed and circulated during the first release run of the film (late 1960s), this old hand painted Bollywood movie poster was originally designed for publicity of the film but never ended up being used. This old Bollywood movie poster was originally hand painted on canvas by a poster design studio in Bombay. Quirky close up portraits of Asha Parekh and Shashi Kapoor are seen prominently in the poster. A smaller portrait of supporting actor Om Prakash appears at the bottom. The entire poster has been set against a red background.